The easier, more portable version of apple pie. The leaves are changing colors, the sweaters are coming out, the girls have all started carrying pumpkin spice lattes- autumn is definitely here. Apple pie is a seasonal classic, but it’s not the easiest thing to throw together in a dorm kitchen. These bars are easier to make, with a nice crumbly dough instead of a pie crust. 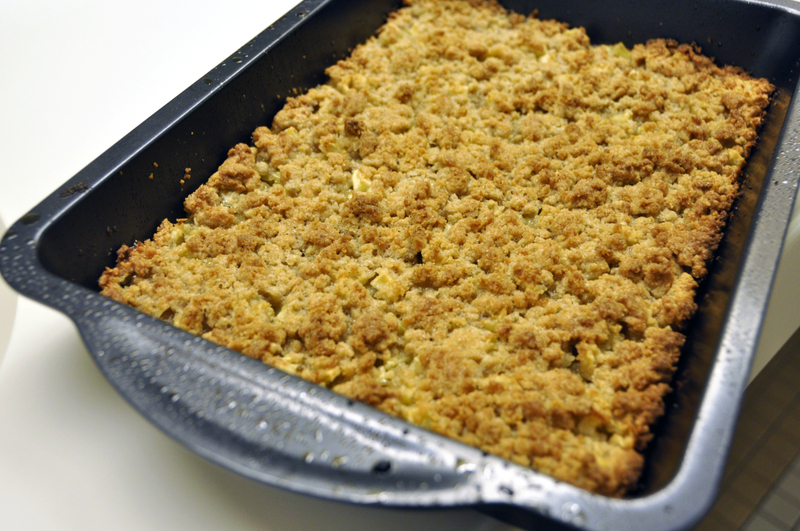 They also have a fantastic crumble-to-apple ratio (heavy on the crumble). Apple crumble bars taste delicious in almost any form: have them regular room temperature, freeze them, warm them up in a microwave, or plop some ice cream on top. These will keep for about a week at room temperature, but I doubt they’ll last that long. 1. Preheat the oven to 375. Grease a 9 x 13 pan; set aside. 3. 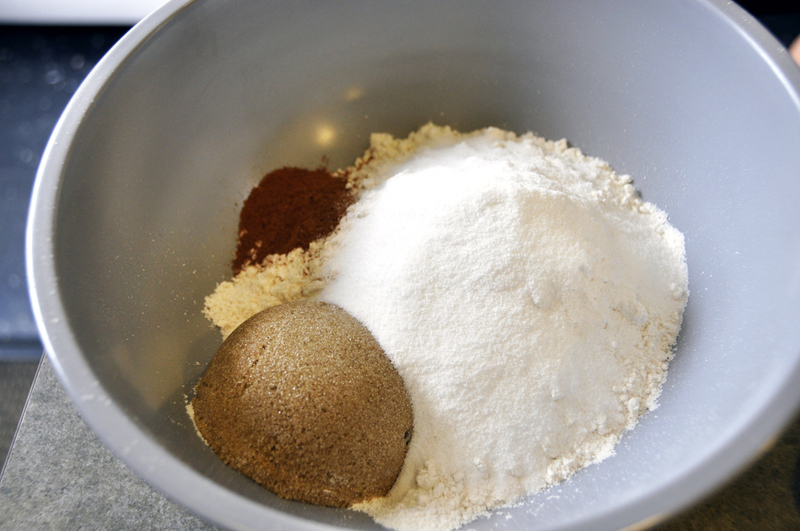 In a medium bowl, mix the flour, brown sugar, 1/4 cup granulated sugar, cinnamon and salt. 4. Work in the butter and egg with a your hands (or be fancy and use a pastry-blender) until pea-sized clumps form and no loose flour remains. 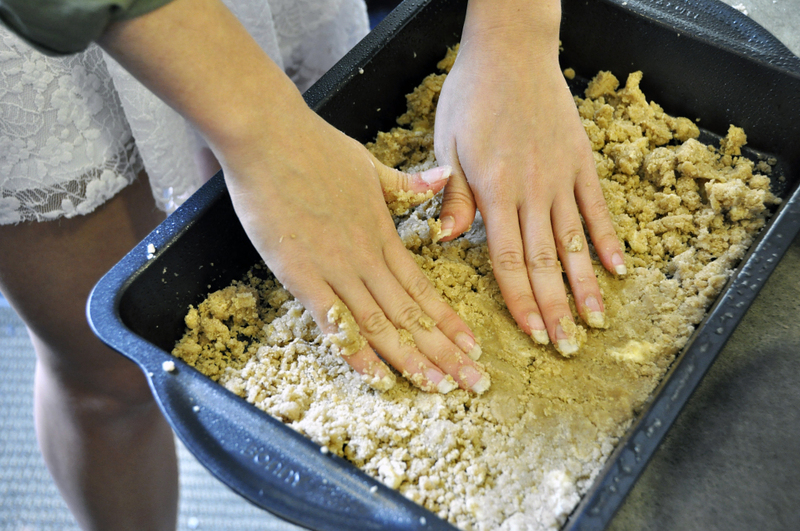 This entails a lot of squishing up the butter pieces with your fingers and working that into the flour. 5. 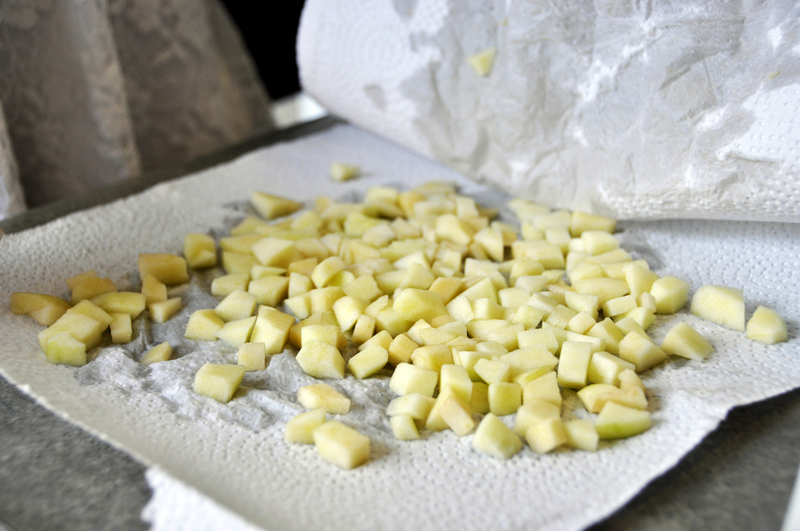 After rinsing your hands, squeeze out any excess liquid from the cubed apples between paper towels. 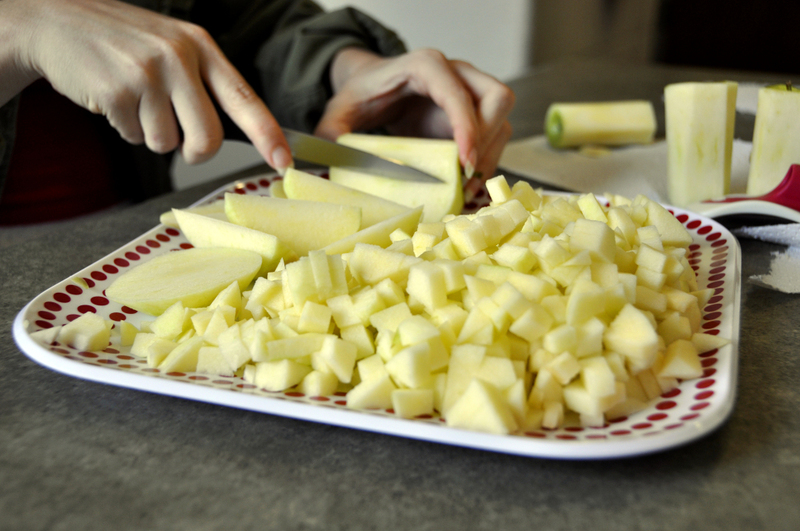 Go a little bit at a time to get the most moisture out of the apples. 6. 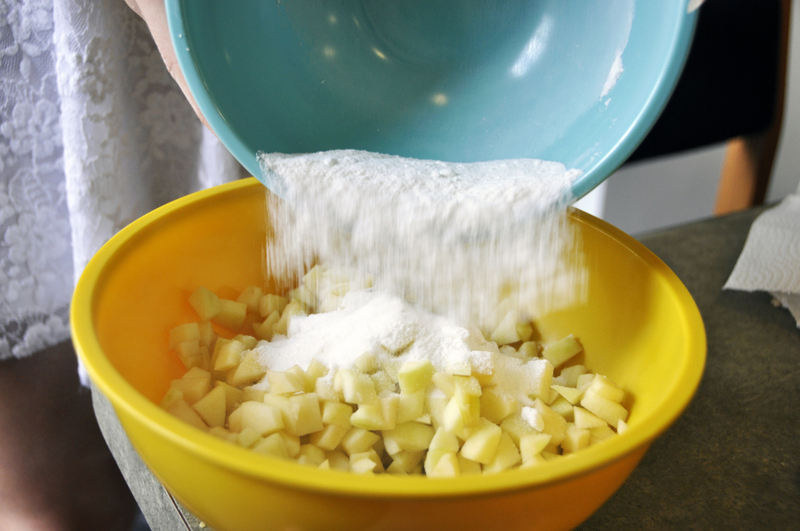 In another bowl, stir together the 1/2 cup granulated sugar and cornstarch, then mix into the cubed apples until throughly combined. 7. 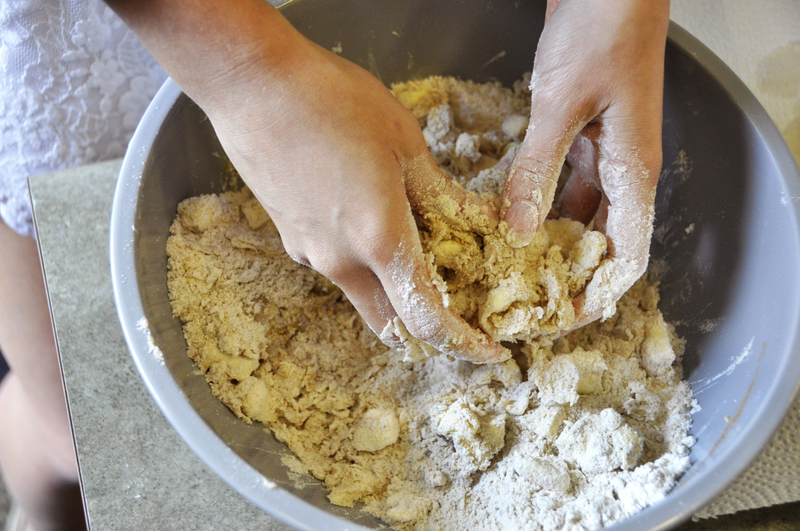 Press half of dough mixture evenly into the prepared pan. 8. 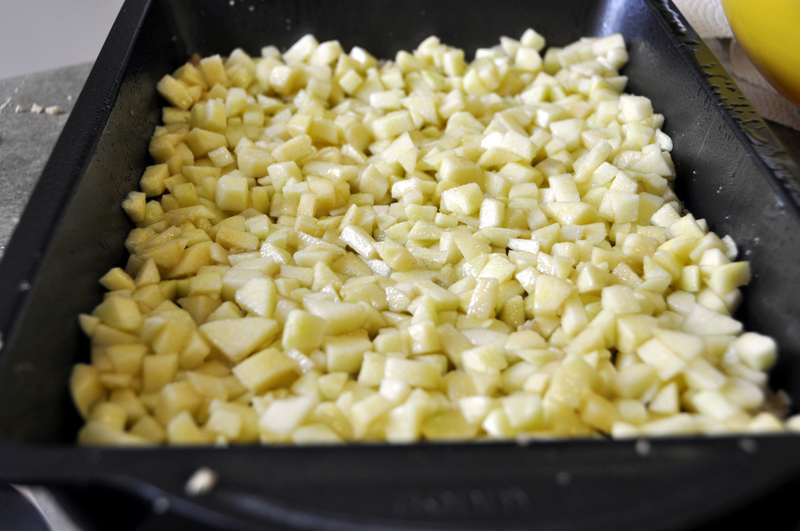 Sprinkle the apple mixture evenly over the crust. 9. 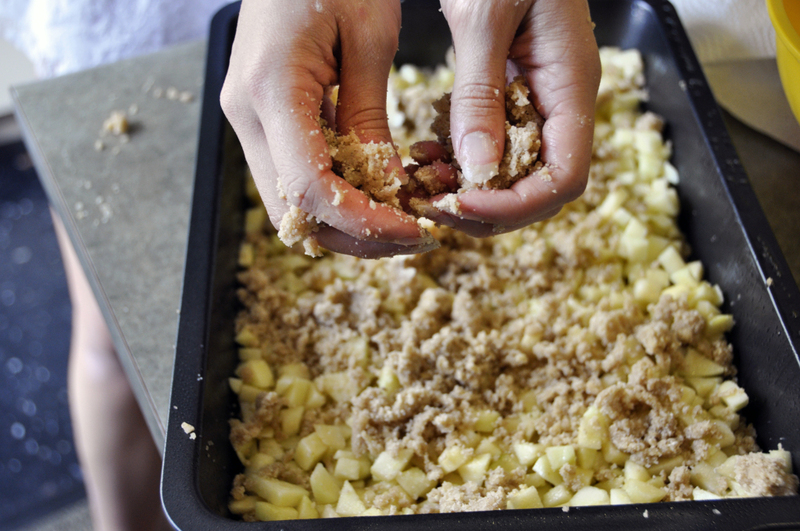 Crumble the remaining dough over the top of the apples. 10. Bake for about 30 minutes or until the top is slightly golden. Let cool completely before cutting into squares.